With a break from the cliff top views it’s the serene River Axe Estuary flanked by flocks of curlew, sandpipers and egret that is crossed this morning using the Old Toll Bridge, the former Toll Gates no more - burnt on the beaches by the fed up locals at the turn of the last century. The bulk of today’s walk then is truly unique through one of the most unusual terrains of the entire South West Coast Path as it enters the Downlands Undercliff. A National Nature Reserve since 1955 of over 800 acres, this is a jungle-like untouched land where the geology and the scrub vegetation has literally run riot following the Christmas Day landslip of 1839 when the land slipped towards the sea after storms. For those living here at the time a huge section of coastline literally fell off the end of their world, apparently leaving a “terrible devil like stench of brimstone in its wake (!)”. Overnight an 800m long abyss appeared, so dramatic that a new island was formed by it which the terrified locals named Goat Island. The final miles of the Devon Coast Path twists and turns through the maze like tunnels of undergrowth beside the chasm in a land home to over 80 species of bird and unique in the fauna found here. Virtually untouched by man for over 150 years, badgers, foxes and roe deer roam free through ivy covered ash, sycamore and hazel which in turn fight with areas of thick fern and gorse. It’s a bizarre walk with periodic views from the jungle opening out onto a twisted, contorted and untouched coastline that is all but impossible to get down to. Eventually you exit the dark undercliff to emerge above the coastline with views now of the new challenges ahead on the horizon towards the mountainous “Golden Cap” and panoramas as far as the Isle of Portland. 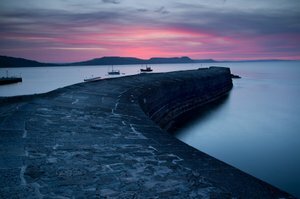 A final descent today brings you to Lyme Regis with its 13th Century crescent shaped harbour wall – The Cob – probably the simplest and most atmospheric harbour Quay along this coast. It’s where the Duke of Monmouth arrived in 1685 though these days better known as the spot where The French Lieutenants Woman stood and stared out to sea in John Fowles’ tale. Jane Austen based Persuasion on the town, though amongst the many fossil hunters who arrive here today it is Mary Anning the local girl who lived, collected and inspired generations of scavengers from here who was the most famous resident. She worked tirelessly on her finds unearthing countless fossil gems including the first complete plesiosaur in 1824. 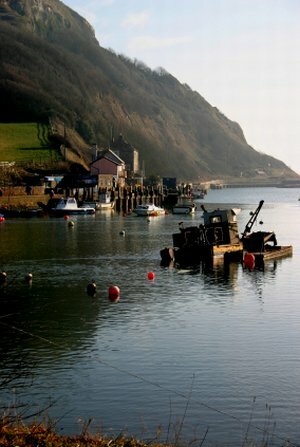 The Lyme Regis Museum, like the town, is full of fossil information and guided fossil hunts can be arranged from here and in the Land of the Fossil at the heart of the Jurassic coast it’s hard to avoid getting swept up in the Fossil Fever with a speculative wander along the beaches and rock pools nearby.